Jenna Weber of Eat, Live, Run shares her recipe for black bean chili to keep you warm and cozy as the colder months approach. See the full post at the Fresh Tastes blog. Heat the olive oil in a large heavy pot (dutch oven work great) over medium high heat. When hot, add the onion and sauté until lightly golden—about 6-8 minutes. Stir frequently! After the onion has started to caramelize, add the minced garlic and continue to cook for another 30 seconds. Then, add the chili powder, cumin and salt and mix well. Add the two cans of fire roasted diced tomatoes, the water, the dried beans and the chipotle peppers. Bring to a boil then slightly cover (leave about ½ inch open) and simmer for three hours. Season with additional salt to taste. 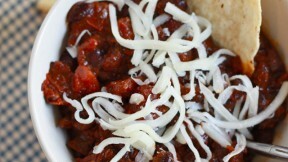 Serve chili with grated cheese and sour cream.